The search for life beyond the solar system has long focused on the habitable zone (HZ). This is the region around a star where a planet with the right properties could maintain liquid water on its surface for a substantial period of time. The classical inner edge of the HZ is set using the runaway greenhouse effect, in which a positive feedback loop causes oceans to evaporate, creating an oven-like world similar to Venus. The classical outer edge of the HZ is set using the maximum greenhouse effect from carbon dioxide, which is the distance at which adding carbon dioxide to a planet’s atmosphere starts cooling the planet (due to scattering the light or condensation). There have been many other calculations of the HZ edges using different assumptions, such as a nearly desert planet and planets with different masses. In this paper, the authors try to use volcanoes to expand the edges of the HZ. They calculate the HZ edges for atmospheres with significant amounts of hydrogen gas produced by volcanoes, another powerful greenhouse gas. An atmosphere with significant greenhouse warming due to hydrogen is difficult to maintain, because hydrogen gas escapes atmospheres quickly. However, early in the Earth and Martian geological histories, volcanic outgassing of hydrogen may have exceeded atmospheric escape of hydrogen. This means that both planets might have had significant amounts of hydrogen in their atmosphere. Different conditions in the mantle could make this hydrogen outgassing occur over a much longer timescale and therefore give the planet a longer hydrogen-induced greenhouse effect. Using this volcanic outgassing as their source of hydrogen, the authors used a 1D atmospheric climate model to compute the edges of the HZ for an atmosphere composed of nitrogen, water vapor, carbon dioxide, and hydrogen for stars with temperatures between 2,600 K and 10,000 K. A variety of atmospheric concentrations were tested up to 50% hydrogen (30% hydrogen is the highest concentration they could reasonably acquire by assuming different geologies, but 50% was included as an extreme outlier). Because these models depended on so many variables, many assumptions were necessary in the model too, such as plate tectonics, the carbon-silicate cycle, an oxygen-reduced (i.e., oxygen-poor) mantle, and a constant albedo. Adding hydrogen into planetary atmospheres moved both the inner and outer edges of the HZ outward. The outer edge moved farther than the inner edge, which widened the HZ. The incident stellar flux (the amount of energy hitting the planet per second per square meter) needed to maintain liquid water on the surface at the outer edge of the HZ decreased by 25%, 44%, and 52% when the atmosphere was 5%, 30%, and 50% hydrogen, respectively. This moved the classical HZ edge from 1.67 AU to 1.94 AU, 2.23 AU, and 2.4 AU, respectively. The HZ expanded much more for the hotter stars than the cooler stars. The inner edge of the HZ, on the other hand, shifted only a tiny bit: 0.1% outward for 1% hydrogen and 4% outward for 50% hydrogen. Figure 1: The outer edge of the habitable zone. The x-axis is the amount of energy received from the star per second per area, and the y-axis is the temperature of the star. The stellar temperature is important because it changes the distribution of energy hitting the planet (e.g., a higher proportion of the incident energy is in the infrared as the stellar temperature decreases). The dashed line is the classical outer edge of the HZ. The solid line is the empirical outer edge using evidence suggesting that early Mars had liquid oceans. The red lines are the outer edges of the HZ for atmospheres with different concentrations of hydrogen. For reference, the Sun’s effective temperature is 5,780 K (where Mars is). It is expected that terrestrial planets are born with oxygen-reduced mantles. 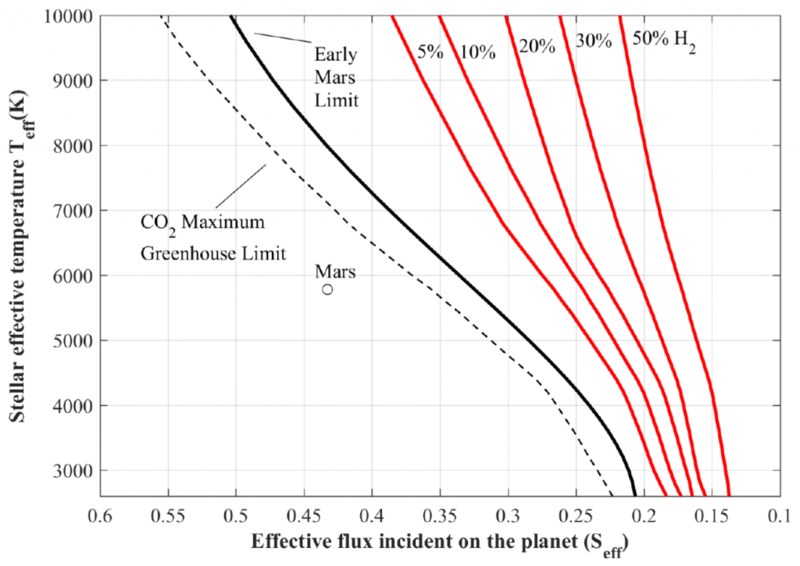 A planet with a reduced mantle is more likely to have an extended period of hydrogen outgassing and therefore a longer hydrogen-induced greenhouse effect. Over time, however, the mantles become oxidized. Some research has suggested that smaller planets’ mantles (like Mars’s) stay reduced, while larger planets’ mantles oxidize quickly. This suggests that hydrogen outgassing might only be relevant for smaller planets. On the other hand, more massive planets can hold onto hydrogen more easily due to their gravity and higher likelihood to have a strong magnetic field. The relationship between planetary mass and the effectiveness of hydrogen outgassing on habitability remains unclear. In our own solar system, Earth’s mantle may have become oxidized only about 100 million years after formation. Mars’s mantle, though, may have stayed reduced for a billion years. Two meteorites (called ALH84001 and NWA Black Beauty) from 4 billion years ago support this idea. Therefore, hydrogen outgassing from volcanoes could have contributed to a warm, wet, early Mars. I’m a 5th year graduate student at Yale University. My main research is on the discovery, characterization, and statistics of exoplanets. I’m also one of the science leads on the citizen science project Planet Hunters, a website where the general public can join the search for exoplanets. Pingback: Habitable zones with volcanic hydrogen?